Take Me To the Brookshire! There is a cool spot in Williamston, just outside the Lansing area, a bit East of Haslett and Okemos that you have to check out. It&apos;s the Brookshire Inn and Golf Club! I really like this place and truthfully, the toughest thing about telling you why, is - where to start.First its a charming and scenic setting, off the beaten bath and very easy on the eyes, no matter what time of year you visit. It has a unique decor indoors and outdoors is something really pleasant when we&apos;re graced with summer weather. The restaurant at the Brookshire is just fantastic. A broad menu with a nice range of items from sandwiches to pizza, to steaks - there is something for everyone. I was there just the other day and had a steak that I will simply call, incredible. Another thing about the Brookshire that&apos;s fantastic is the salad bar! I mean it! Who doesn&apos;t love a great salad bar, and am I right that these are things that are becoming hard to find? Used to be every restaurant had a salad bar at some varying level of quality, now they are all but extinct. Well, I&apos;m here to say the salad bar at the Brookshire is great and when I was there the other night I had not only a rockin&apos; good salad but the best loaded baked potato soup of my life. So this place is worth checking out just for the restaurant, but you&apos;ve got to really give yourself (and your dining party) a treat and also come back in the spring and summer. 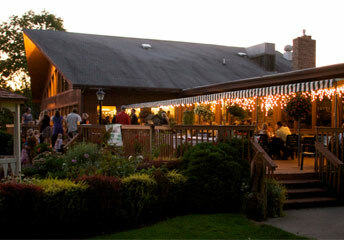 The Brookshire boats a terrific patio for outdoor dinner and drinks that puts you at ease in no time. If you&apos;re a golfer though there is a whole additional reason to love the Brookshire in Williamston. They have a really nice 18-hole, par 72 golf course that I&apos;ve played many times and enjoyed thoroughly. Once I played it a Bachelor party and the other few times were all at golf outings. Speaking of events, these guys do a great job with all that too. From weddings to special occasions of all kinds they have the scenic grounds, banquet facilities and all the little things to make an event perfect-o. Then, from a pure golf angle, the course is scenic, challenging and laid out in a way thats both aesthetic and interesting from a play perspective. Only a few more months and people will be making plans to golf, I say, give the Brookshire a try, you&apos;ll be back. So while you have to wait to golf, you could go there to eat tonight if you want! And I mean it, the place is great. Great staff, great ambiance, great bar, great food. When people are talking about where to go eat, I quite often say, "Take me to the Brookshire!" Here is the Brookshire in the summer! All outdoor eating, awesome steak off the grill, just got done golfing please give me a cold beer, type of feel! Looks great right?